What is the purpose of the book? (To describe, persuade, entertain, inquire, socialise, explain, instruct, recount) If students are unfamiliar with this language ask them if the book entertains them, provides instructions on how something works, tries to convince the reader, etc. What type of language is used? (signal words, tense, adjectives). If students are unfamiliar with these terms, prompt them by asking if the language style sounds like we are talking (informal) or like the way the principal addresses the assembly (formal). If multiple copies are not available this activity can be completed by rotating copies of each book in the small groups. Use a recording table to collect information in small groups. Share as a whole class with the teacher collating all information into one table. Read The Little Corroboree Frog for enjoyment with the whole class. At the end of the reading discuss why the authors, Tracey Holton-Ramirez and Angela Ramirez, may have written this story, linking to what the students discovered in the ‘Familiarising Activity’. Read the back page to the class and elicit from the students some thoughts about the authors’ intention of writing and illustrating this text. Hone in on the fact that writers and illustrators use texts to influence change about social issues that concern them. Explore examples of possible social issues within the school and their community by recording ideas on differently coloured post-it-notes (one for school issues and another for community issues). Ask students to identify issues that concern them in their school and home community and record on post-it notes using the same process. Consider if the future of the corroboree frog is a concern for them. Ask students what coloured post-it note it should be written on. Is it a school or community concern? They may suggest that a new colour could be used as they create a new category. Begin lesson with an Acknowledgement of Country, explaining why we do this. 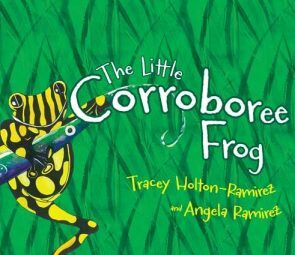 Discuss how the authors of The Little Corroboree Frog have chosen an issue that is not in their local community. Refer to the AIATSIS map of Australia to demonstrate the distance between that of the authors’ home with the Ngarluma and Yindjibarndi peoples and the home of the corroboree frog in the snowy alpine regions of Kosciuszko National Park with the Ngarigo people. Ask students to consider further social concerns within Australia. Record these on post-it notes and add to mind map. This can be done over subsequent sessions and days as students share ideas with their families and through class discussions. reviewing school procedures such as school rules for playground equipment behaviour, leadership opportunities, how the Student Council works. Discuss the option that Tracey Holton-Ramirez and Angela Ramirez chose for the plight of the corroboree frog. Put students in pairs invite each pair to collect a post-it note about a social concern from the mind map. It may be the idea they suggested or they might like to share an idea with another student. Have each student complete the table (PDF, 109KB) identifying what the issue is, who it affects and ways to address the issue. Ask students to present their information to the class. Share the self-assessment (PDF, 101KB) with the class so that they can self-assess their work and allow you to assess their understandings. Reactions and Problems: Identifying the problem within a narrative and the impact on the characters allows students to follow the ‘arc’ of a story. Discuss the illustrations, and help students to understand that illustrations add to the meaning of the story and that we can read the visuals for more clues. In this experience focus on the gestural mode by honing in on facial expressions and body movements. Scan and display on an IWB or have enlarged photocopies of several illustrations from The Little Corroboree Frog and share these with the students. Record the way the characters are presented using the clues in the pictures. Ensure you present the images out of order so that the students do not rely on the storyline to identify the way the gestural semiotic system is being shown. Then, as a class, order the illustrations so that they are in the correct order to retell the story. Discuss how the boy’s emotions reflect when the problem is identified in the storyline. The illustrations can then be placed on the Feelings Scale (PDF, 95KB). Discuss how this matches the events in the story. What kind of text is this? What would you expect to hear? Show me how you would read this? Does your voice match that? Read this part, does that make sense? Think about what is happening in this part of the story? What would that feeling sound like? Choral read part of the book ensuring that student voices match the meaning of the character’s responses. Have students work in small groups to read a section of the book and then read the sections in order. Provide additional opportunities for students to re-read the book, individually or in small groups, so that they can focus on their prosody and fluency. What do the characters do about the problem? Is it a problem that affects others? Have students respond by using the Prompt Cards (PDF, 98KB) or Prompt Template (PDF, 101KB). Use an inside/outside circle to facilitate the sharing of their work. Students form two lines of equal numbers. One line makes a small circle facing outwards and the other line makes a circle around the inner circle, facing their partner. Students share their work with a partner and then move along three spaces to share with another partner. Alternatively create small groups and give each group a prompt card. Have students record ideas on one sheet. Take a photo on an iPad with students using the iPad photo as a memory peg for sharing in the inside/outside circle. Create a Yarning Circle and ask students to share one word to describe the feeling within the heart of the character they have chosen. Model to students how this information can then be turned into a call for action such as ‘Stop putting rubbish in the river!’ Have students do the same with their examples. Revisit the social issue students chose from the mind mapping experience. Ask them to use the chosen post-it note and completed table to craft a call for action based on this issue. Have students act out their call for action, identifying the gestural literacies they are using. Have students share with a partner and then join with another couple to share their work again. Draw students’ attention to the ‘Did You Know?’ section of The Little Corroboree Frog by scanning in the double-page spread and showing it on an IWB or using enlarged photocopies. Read the text to the class. Ask students to describe the type of language used. Is it like the rest of the book? Many of the facts presented are informational but have been personalised to the plight of the characters in the book and written in first person. Work through the sentences one at a time and work out which ones are text from the characters and text that is presented from an unknown author. The typography, the art and technique of arranging type to make language visible, is different and has been used as an illustrative device (see resource section for more information on this). Discuss the placement of illustrations and how these use the gestural semiotic system to convey emotions of the corroboree frogs with the use of facial expressions indicating relationships and mood. Also talk about the use of circles and soft curves to give a sense of calm and happiness. Talk about font choice too and how it’s not very formal for an expert text. Ask students to suggest another fact from the book and write it on a board or a large sheet of paper. Students should be encouraged to look in all parts of the book including the information at the start and end of the book. Craft the sentence in the same way as the other facts have been presented, that is in first person while still using technical and subject specific language. Continue to build up the statements including those that have been rewritten from what is in the pages of the book already. Create heterogeneous groups and have students create a new ‘Did You Know?’ page for The Little Corroboree Frog book embracing the choice of typography that is non-linear and includes illustrations. Depending on class needs it may also be beneficial to use a Writing Workshop with each group over the week so that targeted support is available for this stage of writing. font is large, colour can be used for effect. Repeat with other examples. Then have students look at their ‘Did You Know?’ page and select a sentence so that they can identify the process/es. For further consolidation of this concept it would be worthwhile to use Popplet (ios only) to design a sorting task to reinforce this functional grammar concept. More teaching ideas can be found in Playing with Grammar in the Early Years, specifically learning experience 5 – Classifying Words. What Repeats? When writing to engage in social action, repetitive phrases are often used to position the reader and listener. Repetition puts emphasis on particular parts of a text and can be used to create dramatic tension or draw attention to specific information. Use the sentence from the previous learning experience, where students identified the process/es, to demonstrate how this word can be used repeatedly in a protest slogan. Select a process (e.g. look) and then model how to write a protest slogan using repetition (e.g. Look at the hurt animals! Look at their homes! Look at what we are doing!). Ensure that students understand they can change the identified word to a different tense/suffix to ensure meaning is maintained and used effectively. Refer back to The Little Corroboree Frog’s typography on the ‘Did You Know?’ page and the images you viewed of posters and slogan boards. Model how you would write your slogan for effect. This can be done on cardboard with a ruler or wood attached or on an iPad so that they can play with font choices or on a template (PDF, 93KB). Have students look back at their individual work and select a word (a process) to repeat in their slogan. Once they have done this create small groups for students to work in where they can share ideas about what they could say in their protest slogan. There are several books that support teachers when engaging in slogan writing with their students including Tadpoles in the Torrens and Here We Go: A Poetry Friday Power Book. Have students craft their slogan onto a poster, board or template. Use the Author’s Chair approach to have students share their writing with their peers and receive feedback. This can be recorded on an iPad or Chromebook so it can be accessed multiple times. More information about this technique is in the resources section. Discuss the features of these books as a class. Compare to the slogans students have crafted and look for similarities and differences. Students may consider that their slogan is already alliterative due to the repeated words. This is a great opportunity to revisit the shared literature and establish criteria for what is an alliteration. Craft a living chart (PDF, 187KB) for current and future use that provides a definition, examples and lists of books of where you can find alliterations. Creating Alliterations: In a modelled writing experience demonstrate how to take the information from the slogan and turn it into an alliteration. Ensure your think-alouds address that it is not the letter itself, but the sound of the letter in that word that makes a poem alliterative. So, ‘gum’ and ‘gigantic’ do not alliterate, but ‘knee’ and ‘neck’ do. Focus on writing one sentence that is a call for action for your social issue. Subsequent sessions will move to a shared or interactive approach as students master the concept of writing an alliterative poem. Recognising that the repetition of consonant sounds, usually at the beginning of words, to create effect, may require multiple sessions to support all learners. Writing Alliterations: Revisit the alliterative poems you collaboratively created noting the key elements of this type of poem. Discuss audience and purpose. Encourage students to plan their poem and play with words before crafting their poem. Allow students to review their writing from their work on The Little Corroboree Frog so that they have many seeds to inspire their writing. Students publish their alliterative poem by displaying it on cardstock with illustrations. Use Flipsnack to convert images into digital books that allow you to flip through pages online. Alternatively use Creative Book Builder to construct a class book. Invite students to present their writing to the class. The class book could also be placed on the class website for sharing with the wider learning community. Use attached rubric (PDF, 176KB) to assess. Tadpoles in the Torrens and Here We Go: A Poetry Friday Power Book. Jantiena Batt is an experienced teacher who has worked as an instructional coach, Early Literacy Officer and a Literacy and Numeracy Field Officer. She has coached teachers across 40 schools in the ACT with a focus on building confidence and capacity in teachers from all levels of experience. Jantiena is the deputy principal at Maribyrnong Primary School and is passionate about quality literacy practices in the early years and whole school practices. She is the current president of ALEA ACT Local Council and has been a member of ALEA since graduating from university.